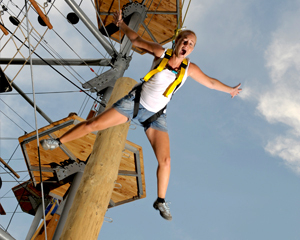 The add-ons for fun & action are exciting attractions that have everything to offer from adrenalin and thrills to excitement to balance and concentration. They significantly boost the fun factor and the time spent by visitors, and make the installation even more attractive for bachelor parties, birthday parties or action fans. You as the operator benefit from additional marketing opportunities and can therefore generate higher sales. 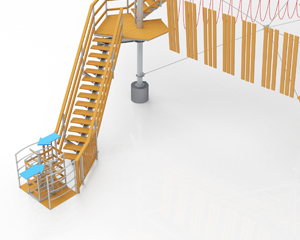 The Fast Track continuous safety system allows the operator to separately market individual attractions mounted on the KristallTurm® high rope course such as the abseiling station or zip line. 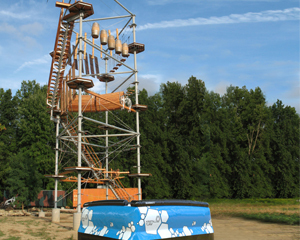 Once connected to the continuous safety system, visitors can climb to the attraction of choice quickly. 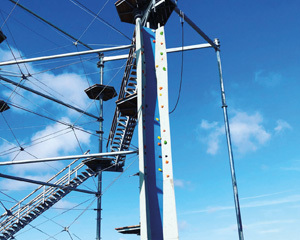 Instruction for regular climbing in the high rope course can therefore be omitted. 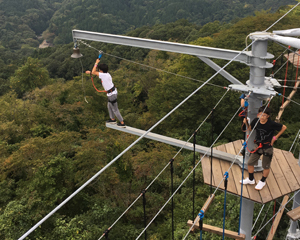 After reaching the destination, the guest can be connected to the safety system of the respective attraction. 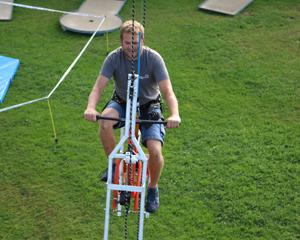 This provides access to the activity with minimal equipment on the harness and in a short time. The Fast Track symbol on the following pages identies the attractions compatible with the Fast Track. Attractions identied with this symbol are used without personal protective equipment. 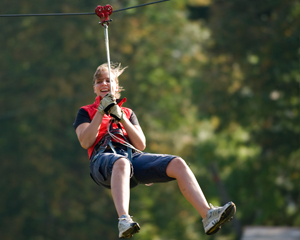 This symbol identies attractions that are also suitable for younger children. The action scale rates the add-ons from 1 like a children’s carousel to 5 like a roller coaster. 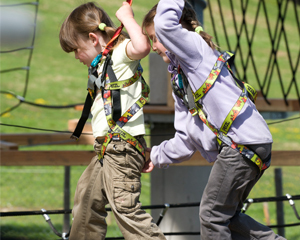 Installing a kids course makes the high rope course a special experience for young guests aged 3 to 8 years. 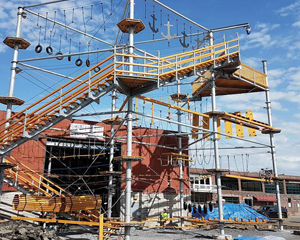 The kids course is installed below the rst level. 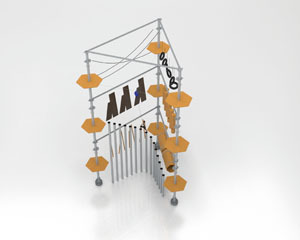 It is at a height that allows parents on the ground to easily accompany their children. 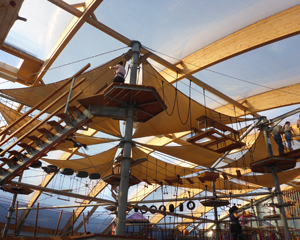 The kids course offers maximum climbing fun for the youngest who are not yet big enough to climb on the upper levels. 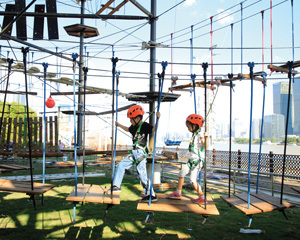 Climbing stations are adapted precisely to the needs and interests of children. 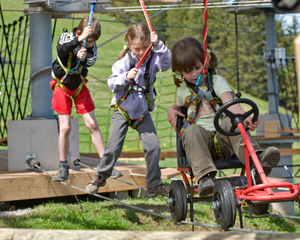 The kids’ course is equipped with a special, pass-through belay system that simplies handling for children and attendants. Parents can rest assured that their little ones are perfectly safe. 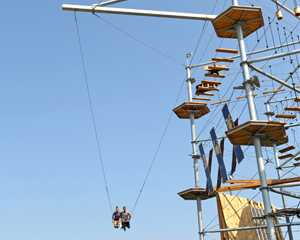 The giant swing is one of the most popular attractions of the KristallTurm® high rope course. It is the absolute screech factor for guests of all ages. 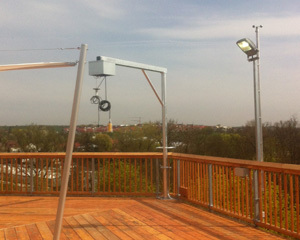 An electric cable winch pulls the swing up to an angle of 50 degrees. 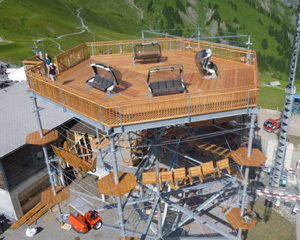 Once it reaches the highest point, the guests disengage it and off they go! children and adults, and supports a high throughput. 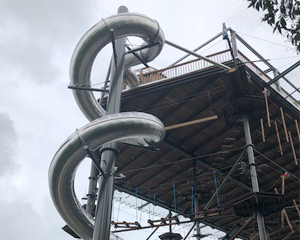 The tube slide is an attraction in the KristallTurm® high rope course that is not only suitable for climbers but all visitors. 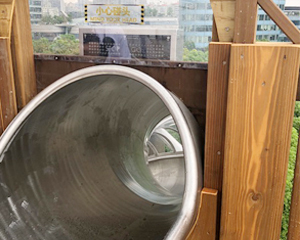 This stainless steel tube slide is used with a sliding bag provided at the entrance. Depending on the version, the user slides down the spiral in complete darkness or in a transparent tube. 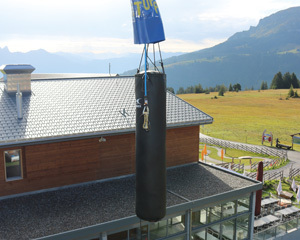 The sliding bag allows active climbers to also use the slide with safety equipment. 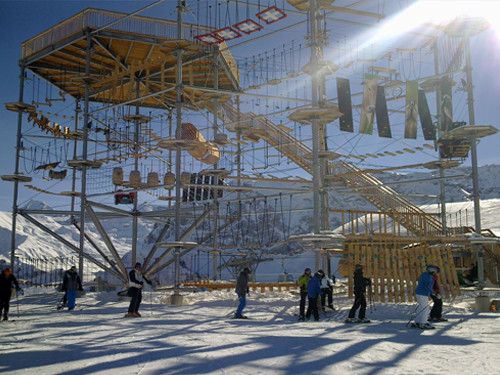 The zip line is an exciting add-on feature for the KristallTurm® high rope course and can be planned in various ways according to local conditions. 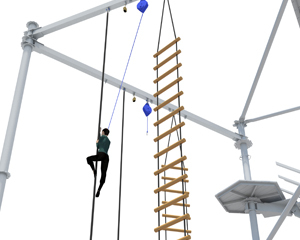 For example, a route from the tower directly to the ground or from the tower to a transfer pole and from there to the ground is possible. 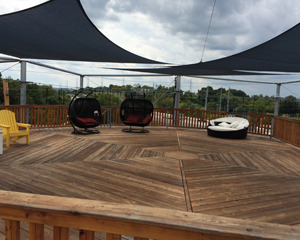 With the third version, guests “fly” from the tower to a transfer pole and from there back to the tower. The route lengths as well as the start and end points are designed according to the terrain. 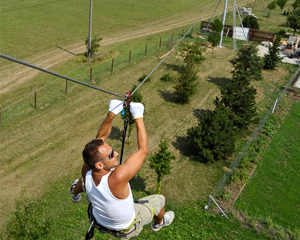 The zip line is especially well suited as an exciting way to descend from the KristallTurm® high rope course. 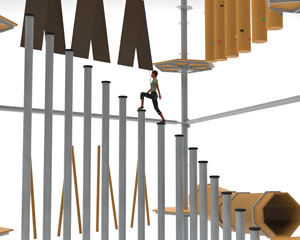 "Walk the Plank" is a climbing element for courageous climbers with a lot of balance. 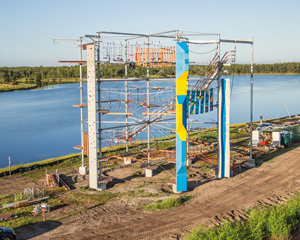 The climbers balance on a small steel beam that leads away from the climbing tower. 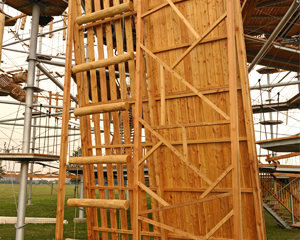 At the end of the beam, a bell is fitted, which the climber can ring once he has reached the furthest end. 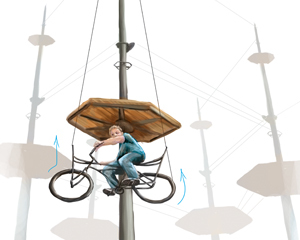 The Bike Lift is a different way to get from one level to the next. Connected to the safety system, you sit on a bicycle and start pedalling hard. Your own muscle power takes you up. If you run out of energy, the TOPPAS fully automatic belay returns you to the starting position. 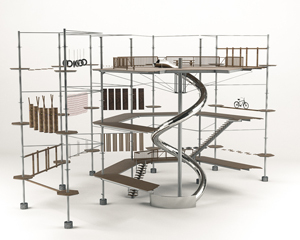 The Bike Lift can be used to get up from the ground or between the levels, and is an exciting alternative to the stairs. With the Trust Jump, the guest jumps toward a foam bag and tries to hang onto it while being gently lowered to the ground by the TOPPAS belay. The challenge is to trust in your own jumping and holding abilities, and to overcome your inhibitions. This differentiates the feature from the regular abseiling station. The Pole Walk lets guests climb from the rst to the second level. It is made of stilts that go up in a semicircle. Climbers have to feel their way forward freehand step by step. Sure-footedness and a sense of balance are required here. 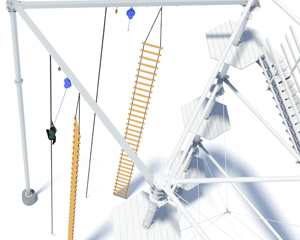 If you lose your balance, the TOPPAS fully automated belay lowers you back to the ground. 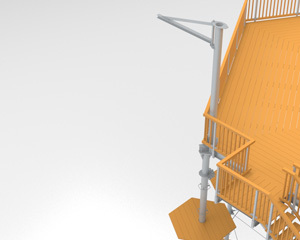 Since the Pole Walk is installed within the tower’s footprint, it does not require additional space. 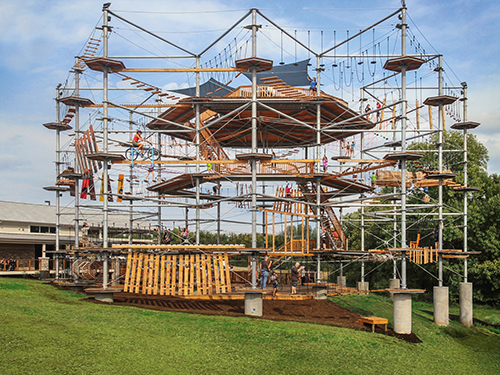 The rope climbing is the ultimate athletic challenge, allowing visitors to prove their strength. 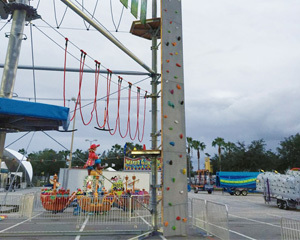 Guests can compete against each other when two ropes are suspended next to each other. 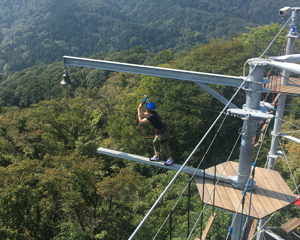 The goal is to climb the thick rope as quickly as possible and ring the bell. 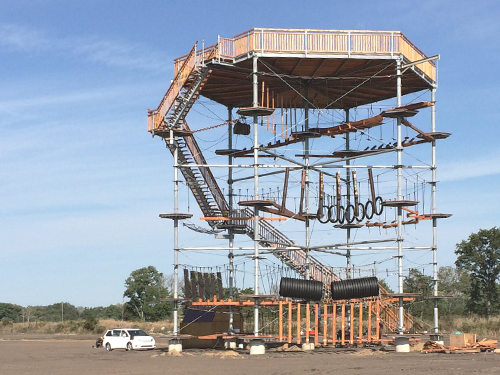 Then the guest is free to either climb down again or be lowered by the automatic TOPPAS belay. 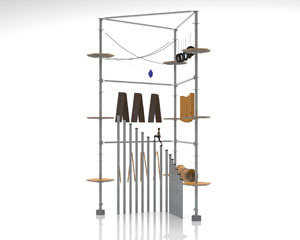 The Jacob’s Ladder is a climbing frame with very large spaces. It can only be overcome when two climbing guests assist each other. 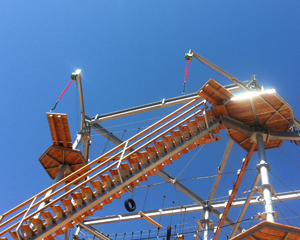 The rest of the team secures the climbers with top ropes. 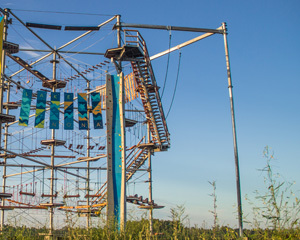 Ideally the Jacob’s Ladder is installed on the back of the climbing wall, but it can also be integrated into the high rope course without that. 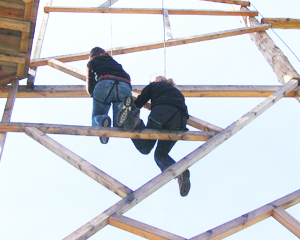 The Pamper Pole is the ultimate test of courage and ideal as an element of the team course. 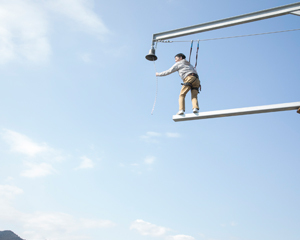 Guests climb to the top of a pole. Standing up at a height of 10 metres and spreading your arms is the most challenging part. 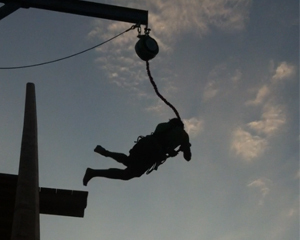 The guest jumps down secured by the belay and is caught a few metres above the ground. 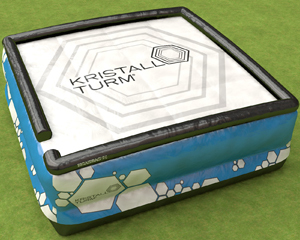 With the Pillow Jump, the user can experience the feeling of a stuntman by jumping into an air cushion without a belay from various heights. 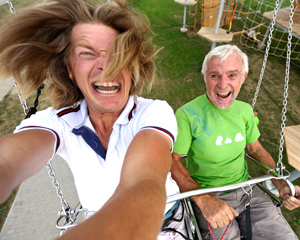 Jumps onto the BigAirBag® are possible from all levels up to a height of 12 metres. 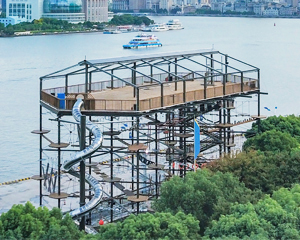 In addition to the adrenalin kick for guests, the Pillow Jump is a gigantic billboard that guarantees numerous photos and sharing on the Internet. operation easier for the operator. The sound system provides entertainment for the guests. 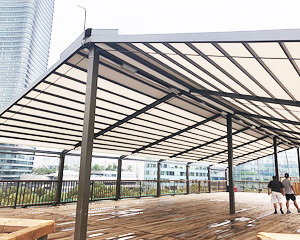 Other add-on components complement the experience, provide shade and offer places to rest. 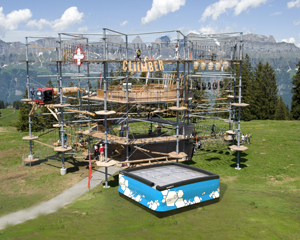 The ground platform with a corresponding substructure is an ideal space for instructing climbing guests. 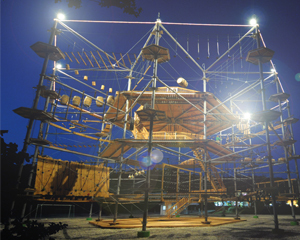 In addition, the ground platform can be used as an event location for parties or other high rope course events. 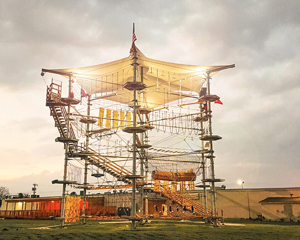 The event platform is suitable for a variety of uses ranging from a lookout point for visitors to a rest station for climbing guests. 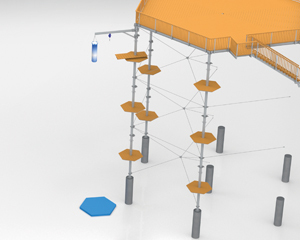 It can be integrated as the second, third or even fourth level depending on the tower version and simultaneously serves as a roof. It reveals its full potential as a venue for events. 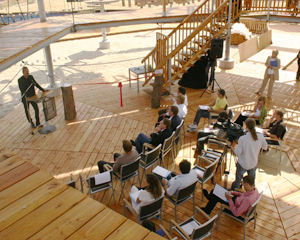 It offers a spectacular location for organisers and is sure to bring in additional revenue. 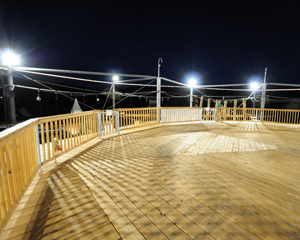 A oodlight system lets the operator extend the hours of operation and makes special offers possible, such as “Climbing under the stars” or “After work climbing”. Extended hours of operation mean higher revenues for you. 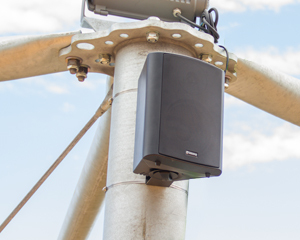 Integrating a sound system allows you to entertain your guests with music. It can also be used as for announcements. 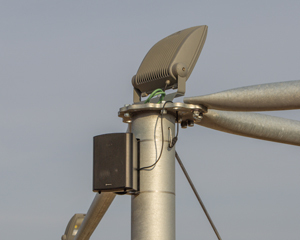 The waterproof speakers are mounted on the installation’s poles and therefore ensure excellent audio coverage of the entire high rope course. 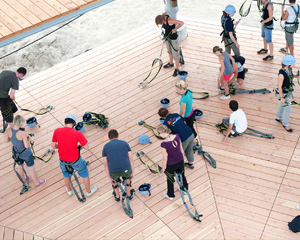 Every KristallTurm® high rope course can be roofed in whole or in part, protecting the guests against sun and / or rain depending on the version. 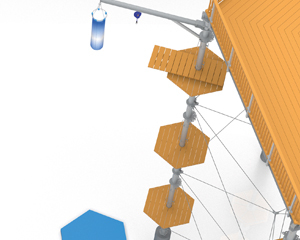 The roong options range from a simple sun canopy to roofs that roll up automatically. 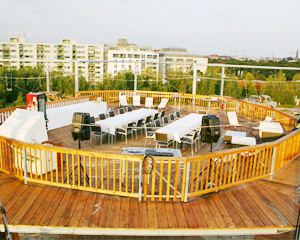 useful when preparing for and holding events at lofty heights. harness do not gain access. 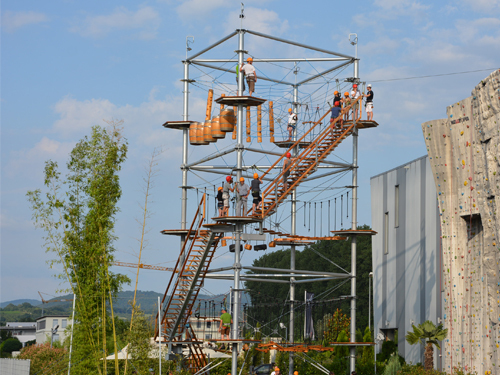 Watch here how much fun it is to climb in the KristallTurm® high ropes course!